January is usually the dreariest month when it comes to movies, too often a veritable landfill of disposable cinema save for all the Oscar hopefuls going into wider release. A critic pal once revealed that he actually employs a sliding scale of awfulness during these turkey days of winter to differentiate between a run-of-the-mill mediocrity and a stage-5 stinker. I have scoffed at this practice in the past. Bad is bad, no matter what the calendar says. But I started reconsidering his approach while watching “Loitering With Intent,” yet another small-budget dissection of what happens when maturity-impaired adults stumble at a crossroads in their journey through life. It starts off promisingly with intriguing characters and a lush summer home setting but ends up as just another reverie about what is truly important—basically, a combination of love, friendship, loyalty and being honest with yourself. And drinking. Lots of drinking. Shots, champagne, beer and whatever dregs are left in that dirty glass over there. Yes, we have seen much of it before. But for the majority of the film’s brief running time (a flicker or so under 80 minutes), I felt myself drawn to what was on screen. Part of it was the engaging, playful cast. Much of it was the inviting rural setting, enhanced by a production design that makes hay out of a wonderful array of flea-market finds and vintage furnishings (calling all HGTV addicts). The jump-and-jivey R&B soundtrack helps immensely as it kicks off with the Jesse Hill classic “Ooh Poo Pah Doo.” But matters go awry when the plot takes a couple of questionable turns at about the two-thirds mark and eventually skids to an abrupt dead end. However, any movie with a cast that includes such live wires as Marisa Tomei, Sam Rockwell and Natasha Lyonne is bound to have something going for it. But the actual stars of this film, directed by playwright/novelist Adam Rapp, turn out to be two veteran second-tier players making their feature screenwriting debut. Their own back stories presumably inspired their characters, two struggling New York actors somewhere between 30 and 40 (referred to as an “age void” by one of their agents) who must work as Brooklyn bartenders to pay the rent. As the more driven Dominic, Michael Godere has the lean and hungry look of a young Al Pacino along with a dog and a girlfriend. His one claim to fame is apparently a guest spot on “Law & Order” where he lost an ear. Meanwhile, Ivan Martin is a cross between Tim Robbins and Lurch as Raphael, a footloose type with a quick wit who envisions himself as a ladies’ man. His career peak? A small role in a Woody Allen film. A long-ago Woody Allen film, unfortunately. When a friend (Lyonne, in a zesty cameo) says she is looking for a movie screenplay to produce for $300,000 so her boss can get a tax break, Dominic lies and says they already have written a Raymond Chandler-style detective yarn for themselves to act in but need to tidy it up. They get 10 days to pull it together, and—in search of peace and quiet—flee the city in an old Cadillac convertible to a country house owned by Dominic’s sister. As Gigi, Tomei (also a producer) brings her usual warm energy and relatable charm to the proceedings, especially when she frolics fetchingly outdoors in a retro madras-plaid swimsuit. Of course, they find anything but serenity amid the bucolic surroundings given that Gigi and her manic-depressive war vet boyfriend, Wayne (Rockwell, who nicely tempers his usual bundle of quirks), are currently at odds and Eva (Isabelle McNally, a beguiling creature), Gigi’s nymph-like former employee, is hanging about as a lust-inducing distraction. Creating even more tension is that Raphael and Gigi once were an item of sorts and clearly still have feelings. By the time that Wayne’s surfer dude brother Devon (Brian Geraghty of “The Hurt Locker”) shows up and incites Dominic’s ire by revealing he’s going to headline a Jerry Bruckheimer wave-riding-with-the-stars reality show, the picnic table is set for a confrontation. 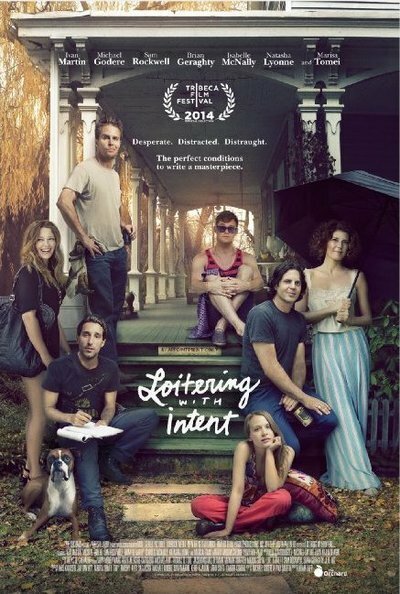 “Loitering With Intent” has many of the hallmarks that define the indie “mumblecore” genre. There also are far too many scenes that end up with people rolling about on the ground, either wrestling or in a passionate embrace. And at least one spit take occurs. But given Godere and Martin’s fondness for cultural allusions, this should rightfully be called riff-core. References, including quotes from “The Sweet Smell of Success” and “Tootsie” and the dropping of such names as Joe Strummer and Ingmar Bergman, are done with such regularity that you can sense when the next is due to arrive.